There we were, partying away amidst friends and strangers, while the clocked ticked away. Around 11pm, a friend came over and called us aside. "The cab is here and so is R, quickly have some dinner and we shall hit the road". Where were we off to? We were going to go on a road trip to a few places, not too far yet not too close. Around midnight we hopped into the cab after shifting our bags from the friends' car to the cab and got set for the journey ahead. R told us we should reach Ajmer sometime in the early hours of the morning and that we should get some shut eye during the drive. We did, probably slept for about 2 hours, but luckily we were neither hungover from the party nor groggy from lack of sleep. We reached Ajmer around 5am, and the car came to a halt within walking distance from the Dargah. The men told us to stay put in the car while they scouted for a "decent" room. It was so sweet, they would go up and down hotels, checking out rooms, coming back to give us a quick review of each. During the wait, quite a few women and children came knocking on the car windows begging. One woman refused to go and kept throwing curses at us as we dint offer her anything. Finally, R came over and said "there is a nice hotel few buildings away, but there is only 1 room available". The two of us chimed in " oh, cool, so lets take it". R was stumped " you gals are ok with that?" .. "yep, we are just going to shower, freshen up and head out, so no big deal" we replied. He dint quite get it, but i guess was glad that his running around was over. We spent about an hour getting ready and then landed at the Dargah's door steps. Out of the corner of my eye i spotted that beggar woman sitting near our car giving us angry glances... I wondered if she was going to haunt us till we left Ajmer. 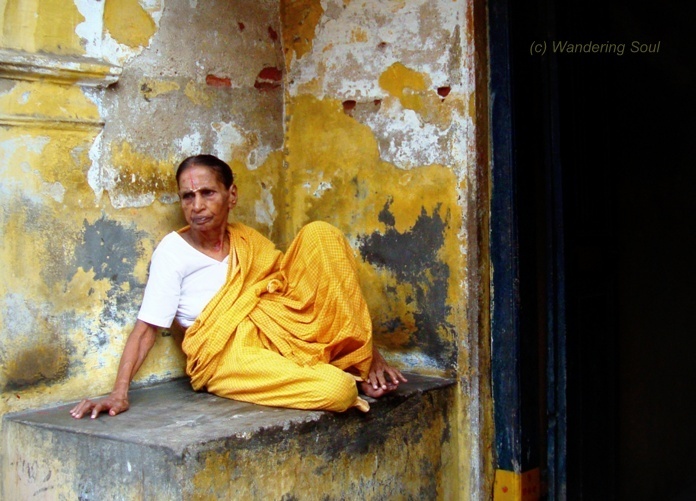 Breaking into my thoughts, a man wearing a white kurta pyjama came over, introduced himself and said he would be our guide. He insisted we girls cover our heads with our duppattas, while the men had to purchase a cap [doppa- hope i got the name right] and also asked us to purchase a few items at the store within the Dargah Complex. 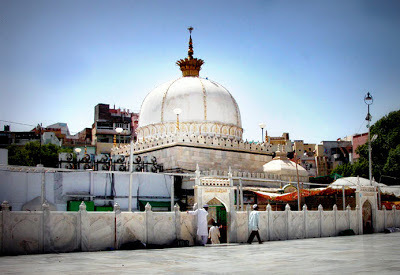 The Dargah [Tomb of the popular 13th century Sufi saint, Hazrat Khwaja Moinuddin Hasan Chisti] campus was huge. 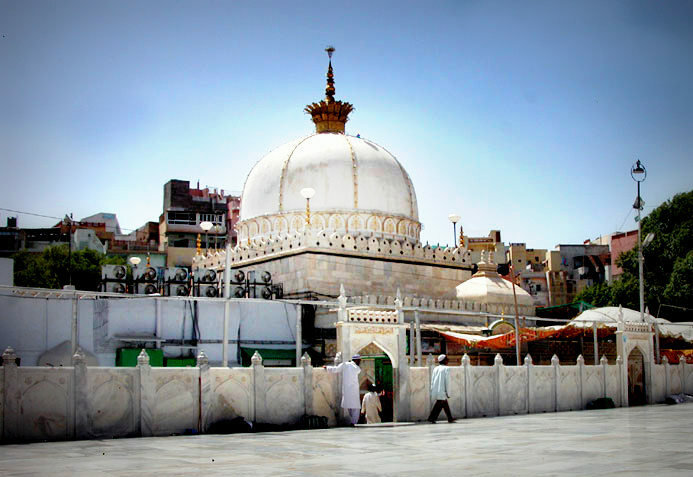 It is the place where the famous Sufi saint has been buried and is a placee where people of all religion visit. it is said that you pray here and your wishes shall be fulfilled. 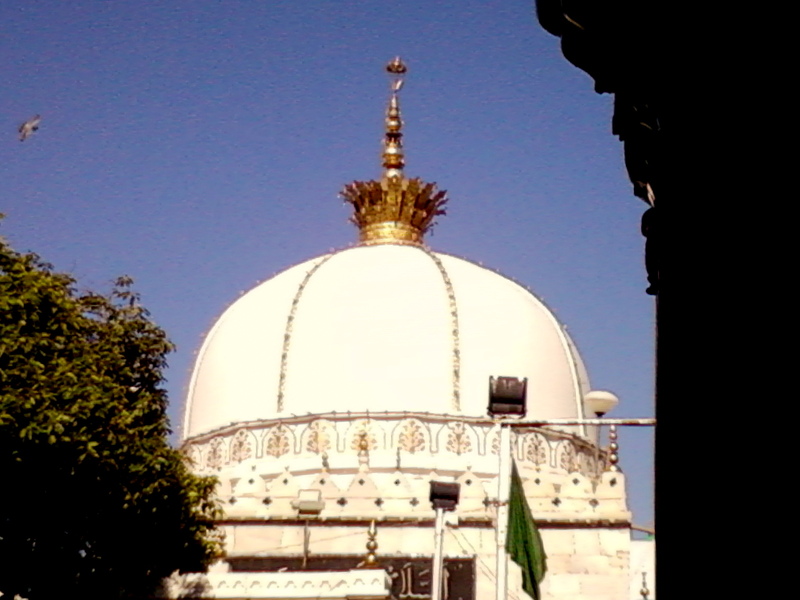 I was reminded of Jodha Akbar and the song "Khwaja mere khwaja" where all the cast is wearing those long flowy gowns and tall caps, twirling.. The guide kept rambling on, he told us that Chaddar, Neema and Ghilaph are the most common offerings made by devotees here. I tuned out and started observing the place, the architecture and the people who seem to be everywhere. The entrance is richly decorated with gold and enamel work as well as with Belgian crystal chandeliers. 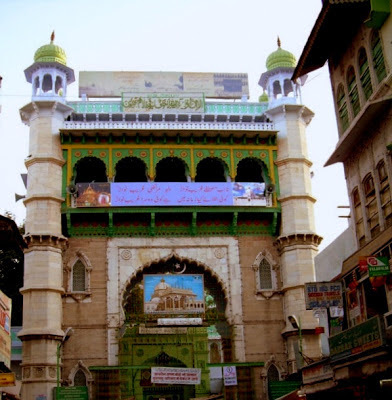 As we walked towards the main part of the Dargah, we noticed quite a crowd milling around. There were also many standing within the center [almost like priests in our temples calling out to devotees, collecting the offerings and then demanding money].. pretty much the same thing happened here. We were asked to walk around the main site and then offer money, and told that 500 or 1000 was the best offering... ;o) [ya right, God wanted nothing less, am sure].. The guide also told us that the crown on the tomb's summit is made of solid gold and the open space in the foreground is a mosque built by the Mughal emperor Shah Jahan. 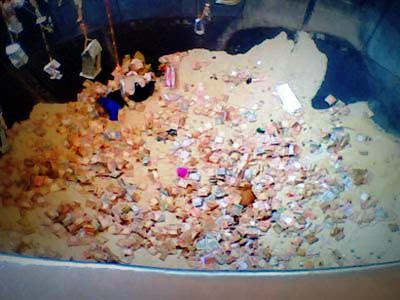 I also saw a huge well of sorts near the entrance, where we noticed sand filled 1/10th of the pit and on top of it was money, coins, jewellery, clothing, and just about everything else you can think of. 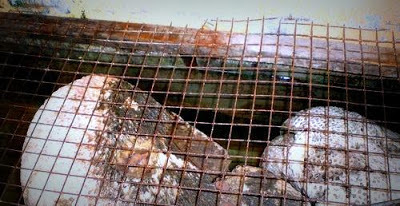 This is where people made their wishes, and on top of the well was a long rod that was fixed from one end of the mouth to the other on which people had tied little things with a thread- shoes, keys, boxes and so on. Depending on your wish, you could tie something or drop in some money into the pit. As i walked around, i couldnt help but notice the small hillock behind the Dargah, and that the land seemed to stretch forever. 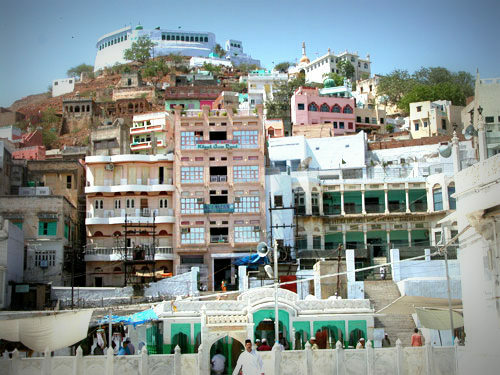 There was a small village of sorts behind the Dargah, and people were walking in/out/ from every direction possible. It was amazing.. And here i had thought this was a dead end road with the Dargh being the last structure on the street. After spending nearly 3hours, the lack of sleep was finally catching up and we got back to the car after saying our final prayers. 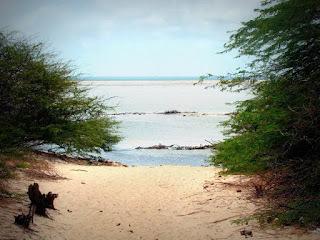 I wondered what lay ahead on our journey as the car exited the narrow lane. 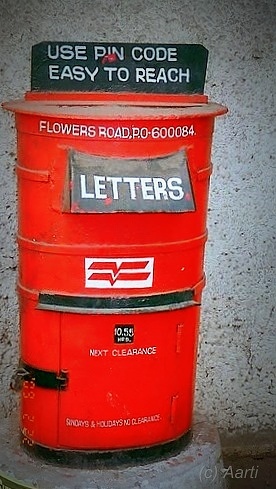 I love writing Letters, sending Greeting cards... Not only that but my postal cards and letters will have stickers, perfume, colour and be lively. I dont know where i got this trait from, probably my uncles - Still remember how they used to send me postcards from wherever they had gone, and i still have most of them. Even today, my uncle in USA sends New year greeting cards to all of us! This is a post box that stood outside Hotel Dasaprakash on PH Road.. Wonder if it is still there.. It was either the last day of somewhere near the last day when we landed in Mysore from Coorg. The entire city was abuzz with activities- there were people thronging street corners, vendors with stalls on every footpath and traffic that was moving, rather inching at snail's pace. We had driven down from Coorg, and were going to spend a night in Mysore before heading back to Bangalore and then to Chennai. One of my friends mentioned that the Palace looks gorgeous in the evening, all lit up and majestic. Towards 7pm, we drove out to meet a friend & her daughter, and then dragged them along to go see the Palace in all its glory. There was so much traffic, all we managed was a few minutes from the car. Friend who was driving asked if we would like to head up the Chamundi Hills and maybe spend some time up there getting a glimpse of the city below. I hope to be in Mysore atleast once to witness the entire Dussehra celebrations!! As we drove towards Dhanushkodi beach, our drive suddenly stopped the car and asked if we wanted to see the Floating stones.. Puzzled, i looked at him and asked "what floating stones?" Instantly he replied "madam, the ones that were used in building the bridge Ramasethu [Adam's bridge] by Rama and the monkeys. There is a Panchamuka Hanuman Temple less than 2 kms from here. I can take you there if you wish". Dint need any more motivation, nodded my head and off we went to the Hanuman temple. 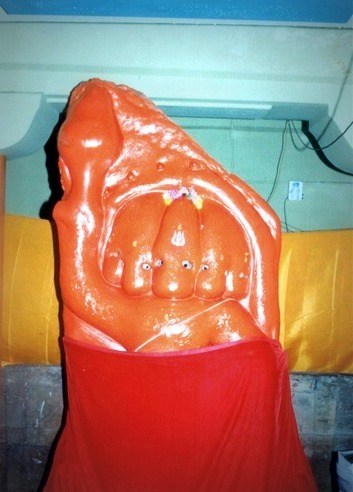 It is a small temple, with the image of Hanuman etched on the wall in red vermillon. The Hanuman has five faces and looks like he is standing leaning on the wall. There were a few pillars and at the base of one i spotted two large stones, on another pillar was the map of how India was back in the days and the path that Rama had taken when building the bridge. As you walk around the main sanctum, there is a small pit of sorts filled with water, and covered with mesh. Inside this tank, lo behold, i noticed there were a few floating stones. The priest came around and told me these were among the ones used by Rama when building the bridge and that the stones really did float. " You cant put your finger in and push them down, but they will surface within minutes, go ahead try it" he said. And much to my amazement, that is exactly what happened. Legend has it that Rama and his army of monkeys decided to build the bridge under the guidance of Hanuman (Monkey-God) and the engineering supervision of Nala. They wrote "Rama" on the stones and used them to build the bridge over the ocean. Apparently, even today, in Devipatnam, or Navapashanam, also by the sea, there are nine stones visible at low tide. It is believed that they were set up by Sri Rama to represent the nine planets, the Navagrahas. The priest recommended i visit the two other temples popular around here- Sugreeva Theertham and Lakshmana Theertham...As i walked out of the Hanuman temple, i wondered if all that i had read and heard in Ramayana was real, and maybe there were more such tales hidden within the walls around us. There are so many buildings that were part of my mom's life as they were growing up. One of those is Casino theater in Mount road... 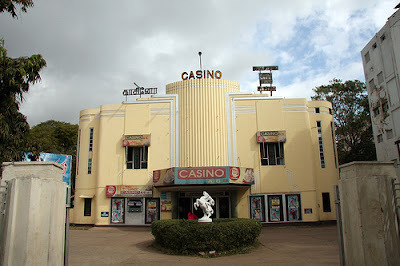 There were not one but 3 theaters along that single stretch of road- Casino., Gaiety and Chitra... Alas, today only Casino remains, the other two have been brought down and Chitra has become a factory while Gaiety is being transformed into a mall..
Have you seen any movies here? heard of any stories? Do share!! Living Gods] comes alive with Dussehra celebrations. The festival begins on the 10th day of the rising moon, which falls on 'Vijay Dashmi day’ and continues for a good 7 days. Kullu Dusshehra is a beautiful amalgamation of history, art, culture and customs. Legend has it that it all began way back in 1637 A. D. when Raja Jagat Singh ruled the Valley. One day, the Raja upon hearing that a peasant Durga Dutt of village Tipri owned beautiful pearls wanted to get his hands on them. Durga Dutt tried to convince the Raja that the he owned no pearls, but the Raja would not hear of it. The Raja gave him a one last chance. Durga got scared of the Raja’s wrath and burnt his entire family in the house they lived in. He also cursed the Raja for being so cruel, this in turn led to the Raja contracting leprosy which is when he realised he was wrong to have suspected Durga. Kishan Das [also known as Fuhari Baba] advised the King to install the idol of Lord Raghunath to get rid of the curse. He sent a Brahmin to steal the idol from Ayodhya and installed it in Kullu. 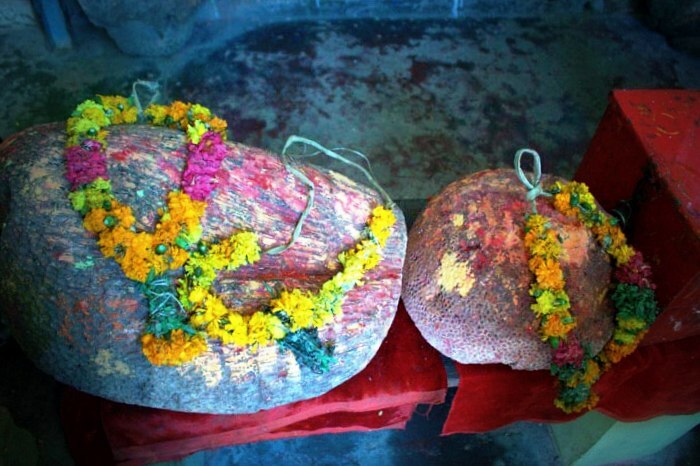 The people of Ayodhya attempted to take Ragunath’s idol back, but it became so heavy and they were unable to take it back to Ayodhya, and surprisingly, the idol became very light when headed to Kullu. On reaching Kullu Ragunath was installed as the reigning deity of the Kullu kingdom. This is how Dussehra came to be celebrated in Kullu. On the 1st fortnight of Ashwini month, the Raja welcomes all 365 Gods & Goddesses of the Valley to Dhalpur to perform a Yagna in Lord Raghunath's honor. On the 1st day- Goddess Hadimba of Manali comes down to Kullu. She is the Goddess of the royal family of Kullu. Lord Raghunath’s idol is saddled around Goddess Hadimba and they are placed in a Rath (a chariot) that has been adorned beautifully. They then wait for the signal from Mata Bhekhli, from atop the hill. All the devotees help pull the rath that has been decorated. Nearly 100 Gods and Goddesses are placed on the several palanquins and taken on procession. It is said that Gods & Goddesses have descended from Heaven to Earth. On the very last day of the festival, the chariot is taken to the banks of River Beas where grass and wood are burnt symbolizing the burning of Lanka [as told in Ramayana]. There is also the local custom of sacrificing animals that follows this ritual. Being in Kullu during Dussehra is a surreal experience, and shows the other side of the valley, one that not many are aware of. It was quite early in the morning and as we walked along Chindatripet, the stench of freshly caught fish hung in the air wherever we went. The lanes we turned into, the shops we visited, the temples we walked into, the smell followed us. 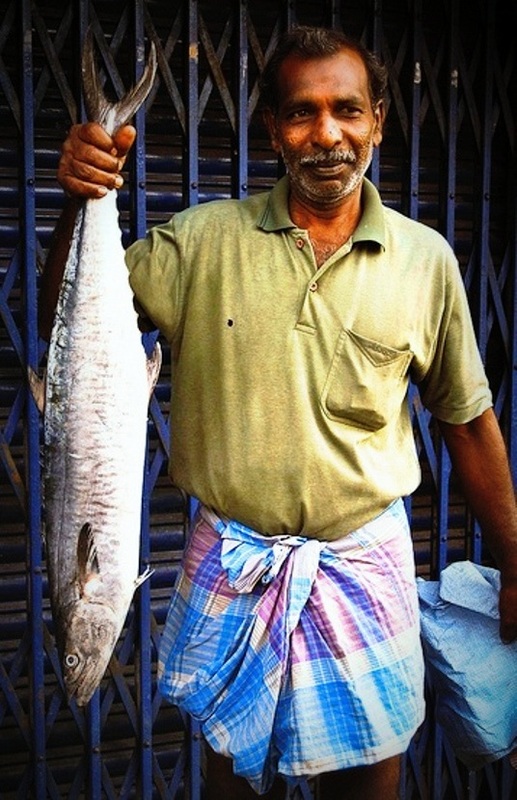 As i looked around, i noticed the fish market was just a hop away, bustling with activity. Vans were going in and some were pulling out, vendors were walking out with baskets filled with different kinds of fish; some had already pulled out plastic sheets on the pavement and were sorting through the loot that would earn them their daily bread and butter, well, more like rice and sambar maybe.. And then, there was this guy standing near a bicycle, holding a fish that was nearly as tall as him. He stood grinning and beckoned us to come click. "Ithu innikku thaan pudichathu.... ithavida perisellam naan pathirukein"[this was caught today, and i have seen bigger ones] he boasted. Look fwd to comments and inputs!! Here is the 1st photograph. This was taken during the recent Photowalk around Chindatripet, near Egmore.. I had attended the Roof top Film fest and so had not got a second's rest, but managed to attend the photowalk, well, atleast 80% of it. As we walked along the narrow lanes in Chindatripet, there were so many houses tucked away amidst the shops and street hawker stalls. Many of them am sure were more than a few decade old, and some had a grill door that hid the main entrance and the house. This one particular house had a huge arch entrance, with a platform of sorts on both sides where people could sit on when waiting for a resident to come meet them. On this, i spotted an elderly lady sitting, staring into empty space. I looked at her, asked if i could take a photograph of her sitting there. She smiled [quite a sad smile] and said "Yes, eduthukko"
When i asked her if she was generally hanging out on a sunday morning, she said she was waiting for her daughter in law to call her when her customary 2nd cup of coffee was ready... If i am inside, the children keep coming to me asking me to tell them stories, she does not like that you see.... Sigh.. felt bad... Just as i was grasping for words, i heard a voice come from within and the old lady slowly made her way to enjoy her cup of coffee..